대방광불화엄경은 줄여서 ‘화엄경’이라고 부르기도 하는데, 부처와 중생이 둘이 아니라 하나라는 것을 기본사상으로 하고 있다. 화엄종의 근본경전으로 법화경과 함께 한국 불교사상 확립에 크게 영향을 끼친 불교경전 가운데 하나이다. 이 책은 당나라 반야(般若)가 번역한 『화엄경』 정원본 40권 중 권 제31을 은색 글씨로 정성스럽게 옮겨 쓴 것이다. 고려 충숙왕 복위 6년(1337)에 최안도 부부가 부모와 자기 부부의 복을 증진시키고 재앙을 없애며, 내세의 극락왕생을 기원하여 교연(皎然)스님의 도움을 받아 만든 것이다. 검푸른 종이에 금·은가루를 사용하여 그림을 그리고 글씨를 썼으며, 두루마리 형태로 되어 있다. 펼쳤을 때의 크기는 세로 31㎝, 가로 881.7㎝이다. 표지에는 금색으로 그려진 화려한 꽃무늬가 장식되어 있고, 책의 이름과 정원본임을 뜻하는 ‘정(貞)’자가 역시 금색으로 쓰여져 있다. 책의 첫머리에는 책을 만들게 된 경위가 쓰여 있으며, 이어 책의 내용을 요약하여 묘사한 변상도(變相圖)가 금색으로 세밀하게 그려져 있다. 이 책은 격식이 제대로 갖추어져 있고, 기법이 우수하여 개인의 공덕을 기리기 위해 만든 것 가운데서는 뛰어난 작품이다. 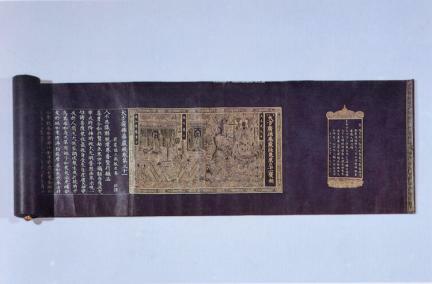 Avatamsaka Sutra (the Flower Adornment Sutra) in Silver on Indigo Paper is also called by its shortened name the Avatamsaka Sutra. The main idea in this Buddhist scripture is that the Buddha and all other living things are not two different entities, but one. Along with the Lotus Sutra, this principal scripture of the Avatamsaka Sutra is one of the books that had the greatest influence in the establishment of Korean Buddhist philosophy. This book is carefully hand-copied from Book 31 among 40 books of the Avatamsaka Sutra Original Edition translated by Banya of the Tang Dynasty of China. 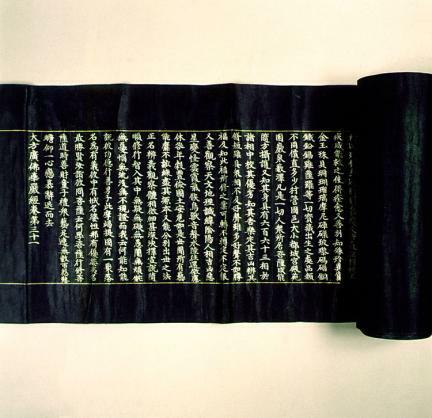 With the help from a Buddhist monk named Gyoyeon, a man named Choe An-do and his wife made this book in 1337 (the 6th year of King Chungsuk of Goryeo) to pray for greater blessings for themselves and their parents, protection from evils and an easy passage into eternity after their death. The paintings and writings were made on the dark blue papers using gold and silver powder. 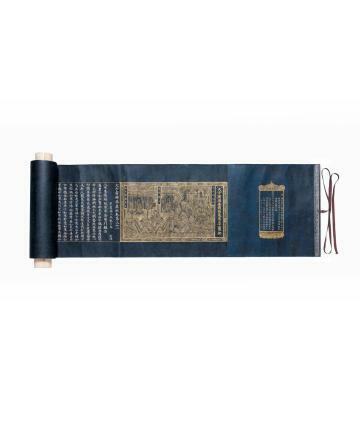 The book is made in the form of a scroll 881.7cm long 31cm wide. The cover is decorated by magnificent flowers painted in gold color. The title of the scripture as well as the letter 'jeong'(貞) implying that this is one of the correct, original version, which is also written in gold. At the beginning of the book is a story written in silver that explains how this book had come into the existence. 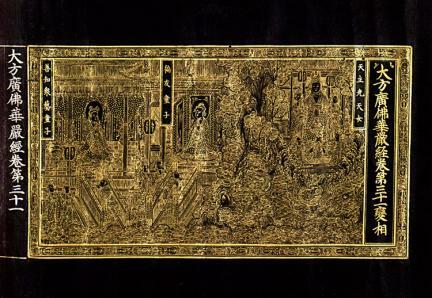 Following it is a sophisticated gold painting of the summary of the book. The main text following the painting is written in silver. Although this book is made for personal purposes, it is an excellent piece of work produced in the formal manner and displaying a superb technique.